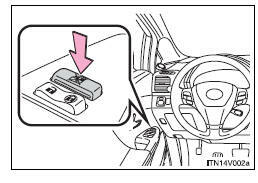 The power windows can be opened and closed using the following switches. *:To stop the window partway, operate the switch in the opposite direction. Press the switch down to lock passenger window switches. ► Vehicles with smart key system The “ENGINE START STOP” switch is in IGNITION ON mode. ►Vehicles with smart key system The power windows can be operated for approximately 45 seconds even after the “ENGINE START STOP” switch is turned to ACCESSORY mode or turned off. They cannot, however, be operated once either front door is opened. ►Vehicles without smart key system The power windows can be operated for approximately 45 seconds even after the engine switch is turned to the “ACC” or “LOCK” position. They cannot, however, be operated once either front door is opened. 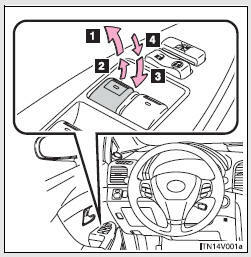 • After stopping the vehicle, the window can be closed by holding the power window switch in the one-touch closing position while the “ENGINE START STOP” switch is turned to IGNITION ON mode (vehicles with smart key system) or the engine switch is turned to the “ON” position (vehicles without smart key system). • If the window still cannot be closed even by carrying out the operation explained above, initialize the function by performing the following procedure. Continue holding the switch for a further 6 seconds after the window has closed. Continue holding the switch for a further 2 seconds after the window has opened completely. the one-touch closing position once again. Continue holding the switch for a further 2 seconds after the window has closed. If you release the switch while the window is moving, start again from the beginning. If the window continues to close but then re-open slightly even after performing the above procedure correctly, have the vehicle inspected by your Toyota dealer. Settings (e.g. Rear window Auto Up/Down) can be changed. • Check to make sure that all passengers do not have any part of their body in a position where it could be caught when a window is being operated. • Do not allow children to operate the power windows. • Never try jamming any part of your body to activate the jam protection function intentionally. • The jam protection function may not work if something gets caught just before the window fully closes.